With par at 33 the difference between an executive length course and a the full length course, is that one or two par fives are par threes. The par fours and par five are full driving holes with 250 yard landing areas. This is a course that golfers of all skill levels can enjoy. It takes less time to play, about 1 1/2 hours to play nine holes, and 3 hours to play 18 holes. The golfer has more meaninful iron shots at Grassy Brook. You begin play with a wide fairway par four . Hole #2, a nice par 3, bunker right. #3 has bunker and water right. #4 is a testy 503 yard par five. #5, par four lined with hills and bunkers. #6 is a beautiful par three. #7 has the tees set back in the bush. 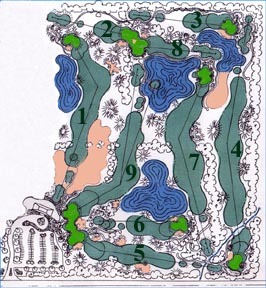 #8 is a great par 3. Finish with a par four offering you exciting shot alternatives. I am pleased to present to you this golf experience. Enjoyable for all skill levels. Forward tees are easy, back tees challenge. The fairways are wide and firm, tee areas are large and level, USGA Spec Greens hold your shot and putt true. Ohio Premium sand bunkers add to this fun, golf experience. There are four lakes that are technically not in play. The lakes are close to play, adding character and beauty. click to goto the hole number seven page for pictures and descriptions.